Chambers Electric, Inc. - Quality service you can count on! Whether you’re expanding your business, retrofitting an old office or bringing in new equipment, we’re here to help put your plans into action. We have more than 30 years experience working in industrial environments — including equipment repairs, lighting and upgrades. Whether you need troubleshooting, a fan installed, new light switches or a major service change, we can do it. Call us at (760) 598-5498 or click here to get a ballpark estimate for your next project. 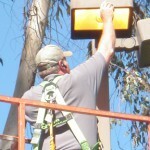 We are a full service, family owned and operated electrical company serving the Southern California area. With more than 30 years experience in the electrical field, we can meet all of your electrical needs, including commercial, industrial and residential projects — small or large. Located in North San Diego County, we’re centrally located to serve San Diego, Riverside and Orange counties. We are proud to have an A+ rating with the Better Business Bureau! We are active in the community and are members of the Vista Chamber of Commerce and the Oceanside Chamber of Commerce. We offer discounts for seniors and, as a veteran owned business, we offer a 10 percent discount for retired and active duty members of the armed forces — thank you for your service! Call (760) 598-5498 for a ballpark estimate or contact us here. Our homeowners association has used Chambers Electric for 7 years for a number of projects, and we couldn’t be more pleased. We couldn’t ask for better quality and dependability. Jack and his crew are courteous, the don’t leave a mess and they explain their work so we know what’s being done. Jack is great at troubleshooting our problems and quickly responds when we have electrical problems that need to be fixed quickly.